"Love must be generous or it's nothing at all"
A story revolving around two young girls vying for the attention of one young man is as old as the hills. Hiroshi Shimizu's 1933 silent film "Japanese Girls At The Harbor" may begin with this shopworn initial premise, but uses it to build a lovely story of the relationship between trust and love. 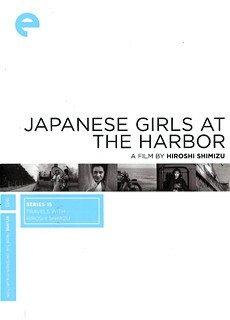 The change in moral values within Japanese society and the lure of Western culture is certainly present within the film given the time frame (after all the main male character's name is the very Western "Henry"), but its focus is on how the girls approach their relationships and their expectations about what love is. Shimizu's gentle touch to the pace of the story along with some outstanding (and very innovative for the time) camerawork and editing make this a wonderful treasure. Sunako and Dora are two school age friends who promise that they will always be together. Until, of course, a boy enters the picture. Not a boy really, but a young man named Henry who rides in on a motorcycle and shows hoodlum tendencies. Sunako runs to him when we first meet him (leaving a dejected Dora behind), but Henry leaves Sunako by his bike to walk over to Dora. Just as the two of them begin their chat, Sunako counters by yelling back to Henry asking for a ride home. He gladly agrees and they leave Dora on her own. The girls settle their differences the next day, but the tone of their approaches has been set - Sunako is aggressive and jealous, while Dora is patient and believes that love will win out in the end. Soon after, when Sunako discovers that Henry has also been seeing an older woman named Yoko, Dora counsels her that she should accept Henry's faults and let things play out. Dora also confronts Henry and tells him he shouldn't be hanging around with his buddies when Sunako is waiting for him. This is how she shows her own love - by being generous to Henry and hoping that he will find his way to her by allowing him to work things out. Sunako, on the other hand, finds Henry with Yoko in a church and as her rival jokes about getting married takes her own drastic steps to prevent that. After Sunako reacts in this jealous manner, she runs away from Yokohama and begins a life of drifting as a geisha. Eventually she returns, but is now cynical and beaten down. She's allowed an artist to follow her back and lives with him, but shows no real concern or affection for him while struggling to come to terms with what she left behind. Though the DVD (part of the "Travels with Hiroshi Shimizu" 4 disc set from Eclipse) comes with an optional musical score, I found the film worked best in complete silence. That's not a criticism of the music itself - a fine new score written by noted silent film composer Donald Sosin - just a statement that the film doesn't need the additional backing of music to shape its tone or emotions. It's all expressed via the visuals. Shimizu's camera stays with the characters via several long strolling tracking shots to allow us time with them, links them between scenes and frames them in different relationships to each other. In the aesthetics of the film, there's a strong resemblance in look and feel to the "poetic realism" approach to filmmaking from France (which began a bit more in earnest a year or so after this film). Whether it was the lovely use of shadows during key moments (presaging film noir), dreamlike transitions or simply the softer, quieter acting style, I found numerous linkages between the two styles even though there are also some quite definite departures in other aspects. Also of particular note is the effective use of editing in several scenes. When Sunako is about to take her measures against Yoko, the camera cuts to closer and closer zooms on her face that heighten the feeling that something is about to occur - it's unexpected and terribly effective. Shimizu uses this tactic again later in the film as a way of conveying a character's dawning realization. Also effective are the slow fades of characters to denote a passage of time. Like ghosts receding from a room to appear again somewhere else far off, the characters sometimes exit a scene by simply slowly disappearing. The subtlety of the acting is also a strength of the film - particularly from Michiko Oikawa as Sunako. She has the widest set of emotions in her character arc and goes from early scenes of happiness and jealousy to later ones of resigned sadness and attempts at covering her real emotions. Her fake "professional" smiles directed at Henry while she works as a geisha are perfect - she's trying to push him away by asking him to be a customer, but at the same time still loves him. The entire film feels so modern in many ways via its acting, the camerawork and the crispness of so many of the scenes thàt it's hard to believe at times this is from 1933. Regardless of when it was made and the context of its innovations, it's a simple, beautifully told and emotionally resonating story. For those who can play Region 2 DVD, and a substantial discretionary budget, there are more Japanese DVDs with English subtitles available for those wanting to see more Shimizu.